These are just a few of your users’ needs, but how well do your library spaces match up? Does your furniture function well in multiple contexts? Can your library spaces easily transform for different activities? To maximize your space — and your budget — follow these four tips for finding flexible furniture to help you better serve your users. Look for furniture that’s easy to move and arrange in different ways when you need to use your floor space for another purpose. Pieces like the Muzo Kite® Mini Mobile Flip Tables and Muzo Kite® 750 Series Mobile Tables help you flex your space to suit the different needs of your users. 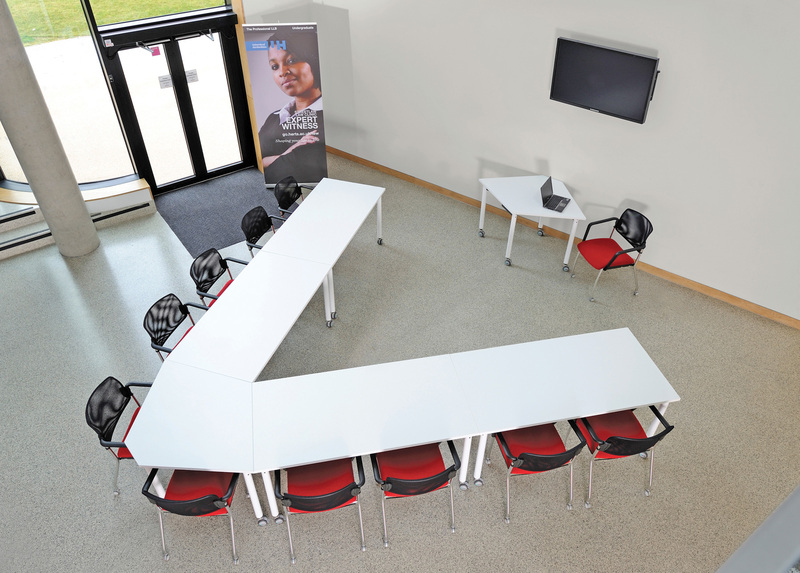 With a variety of shapes that you can rearrange, Muzo tables are great for both small-group work and large-group meetings or presentations. Ease of use is also a factor when you or your users need to rearrange quickly. Look for furniture that is easy to manipulate — not just for you but for your patrons as well. This puts the power in your patrons’ hands and reduces staff time spent rearranging to suit individual needs. 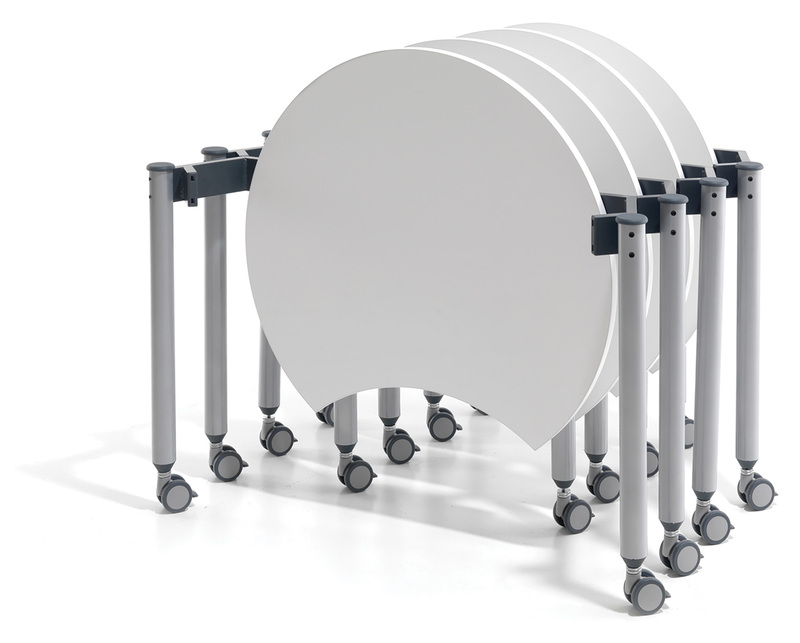 Muzo tables are easy to flip up and roll into place when you need them. When you don’t need them, just flip them down and roll them away. 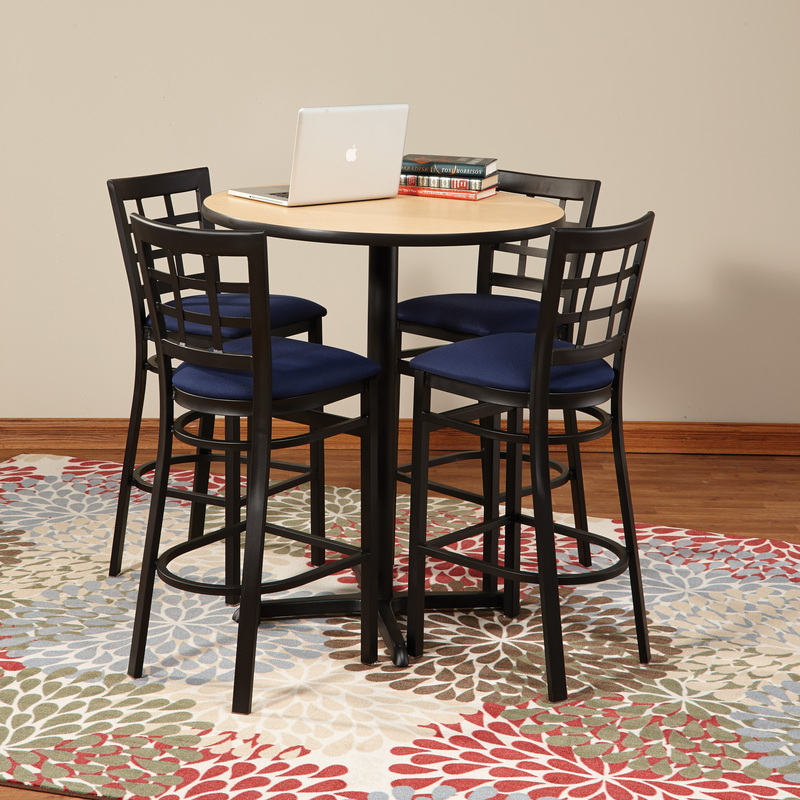 You can also nest Muzo tables together and roll them aside to get the most out of your open floor space. Download the Muzo Folding Table Layout Guide to learn more about how you can use these tables to maximize your space. Look for furniture that you can use in more than one way. Can your users relax and lounge on the piece but also use it for work? It might seem counterintuitive, but even your casual spaces can get down to business. Seating like that offered by OFM Interplay works great in an informal lounge setting. But these chairs and sofas also have a handy surface that moves into place when it’s time to get to work. Pieces like Premier Café Height Tables and Chairs also provide both a place to study and a spot to hang out. And once you have the right pieces in place, encourage patrons and students through signage or programming to use the space in multiple ways. You don’t need to be dragging heavy furniture all around your library. And who wants to fiddle with tricky hardware just to create more space? Instead, focus on furniture that is easy to move so that you, or your patrons, can shift pieces around to suit your needs. Pieces that roll on casters make it easy to create space for teams to work. 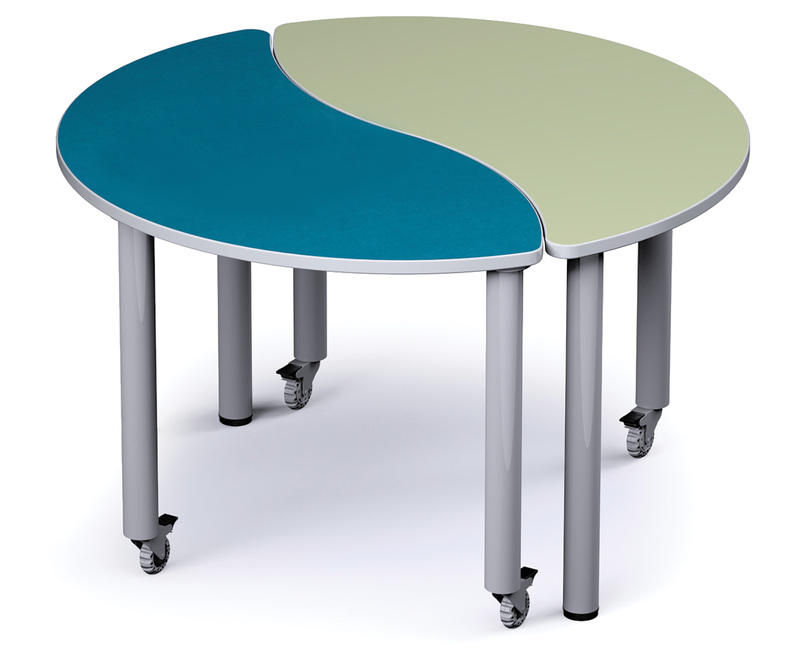 For example, it’s simple to move Engage Collaborative Tables around — even over longer distances. And with mix-and-match shapes, you or your users can put these tables together in fun ways to fit any need. Just be sure to look for locking casters so your furniture is stable when you have it where you want it. You may also find furniture pieces that slide on plastic glides. Though glides work better when you don’t have as far to move, they’re still a great choice to let your patrons shift pieces around to create the space they need. Look for pieces like the HABA® Boomerang Modular Sofa and Ottoman. The modular pieces allow you to create a large seating area that you can easily pull apart to accommodate other arrangements. Do you need to make room for a larger event? Furniture that you can hide away is great when you need more space. Of course, you’ll want to make sure whatever you choose is mobile and easy to move. But don’t forget to think about how easy it is to store the pieces. Does the furniture you’re considering stack or nest together to save room? The Muzo tables mentioned above are great examples of nesting pieces that allow you to make more room. When looking for chairs, check to see if they stack and how many you can stack together. 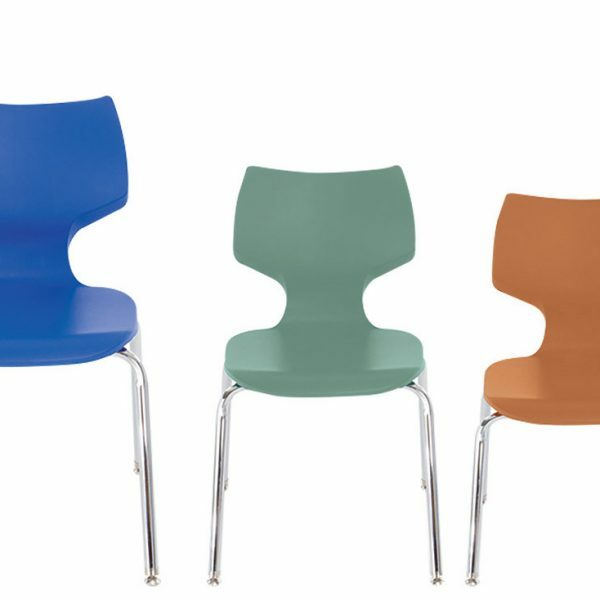 Pieces like Smith Systems™ Flavors™ Stack Chairs create comfortable seating when you need it, but you can easily stack them and move them aside when you need open floor space. Making your library spaces meet your users’ many needs can be a challenge. But the furniture you choose can make it much easier to help everyone you serve. With the right furniture you can make a small space seem a lot larger or make your casual spaces great for work as well. Just look for furniture that is flexible, multipurpose, mobile and easy to store away, and you’ll be well on your way! Furniture Product Manager at Demco, Inc.
As the Furniture Product Manager at Demco, Rita uses her extensive background in product development and merchandising to guide Demco’s furniture strategy and help libraries and schools find the best solutions to meet the evolving needs of their users and students. She holds a Bachelor of Business Administration degree in Marketing from UW-Whitewater. In her free time, Rita enjoys biking, sailing and cheering on the Wisconsin Badgers.